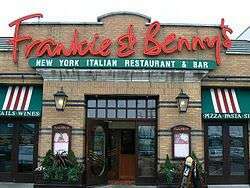 Frankie & Benny's is a chain of Italian-American restaurants in the United Kingdom, with numerous outlets nationwide, run by The Restaurant Group plc. In branches, on menus, and on their official website, the fictional story about the restaurant's origins is presented. The story is that in 1924, at the age of 10, Frankie left Sicily with his parents and moved to “Little Italy” in New York City. Within a year of moving, the family had opened a restaurant, everybody helping with the building and the cooking in equal measure. Frankie went to the nearby high school and became lifetime friends with Benny, already a third-generation American. The business was taken over by Frankie and Benny in 1953, and combines popular American food with traditional Italian dishes. Frankie & Benny's restaurants are themed to reflect the 1950s Italian-American backstory. They are decorated in dark wood, with warm mood lighting and granite effect table tops. There are numerous artefacts in each restaurant which are in keeping with the theme, such as old photos of Italian heritage Americans, publicity shots of musicians and sportsmen, and advertising posters from the period on both the walls and the menus. The toilets often have Italian lessons playing over the speakers, and the restaurant itself plays classic American 1950s pop, albums of which are available to purchase in-house. Staff wear simple black waistcoats, a tie, white shirt, black trousers, and a simple black apron. In 2014, a customer complained after he was served a crab dish containing surimi. The item was eventually removed from the menu. In September 2015, it emerged that a disabled person was not allowed to enter a Frankie and Benny's restaurant as none of the available tables had space for a wheelchair. In November 2015 the chain was given the lowest rating (red) in an assessment of the sustainability of its seafood products. ↑ "The Restaurant Group". Retrieved 2011-10-15. ↑ Negus, Richard. "When trading down is affected by your good covenant." Journal of Retail & Leisure Property 6.1 (2007): 84-91. ↑ "Caterersearch: The Restaurant Group". Retrieved 2012-09-07. ↑ "Frankie & Benny's - Find a Restaurant". Retrieved 2012-09-07. ↑ "Frankie & Benny's". Retrieved 2012-09-07. ↑ Lawrence, Felicity. "Diner is left shellshocked over crab dish". The Guardian. Retrieved 10 May 2014. ↑ Baber, Andy. 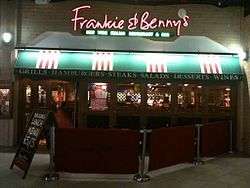 "Disabled Trowbridge woman unable to eat inside Frankie & Benny's due to wheelchair". Wiltshire Times. Retrieved 4 January 2016. Wikimedia Commons has media related to Frankie and Benny's.